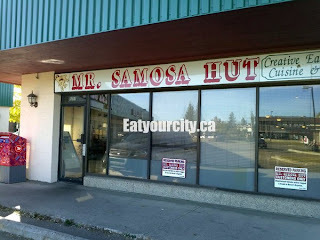 While in the deep south last week, we decided to swing by Mr Samosa Hut to pick up some deep fried treats. 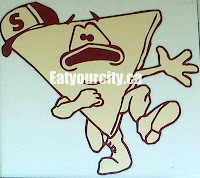 Many of their samosas have found their way into the break room and onto many hips over the years, with it being the favorite place to go for samosas for me and many of my Indian friends. After stepping inside the dim interior, your nostrils are whomped with a hit of greasy fried goodness... both savory and sugary. 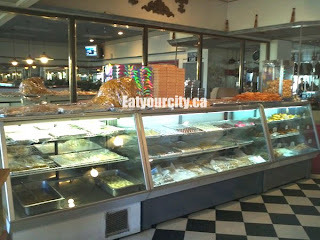 On the left side is a counter packed full of savory fried goodies, and piled high with sugary fried goodies. On the right is a small dining area as they serve buffet curries and the like for lunch, with the buffet table at the back. We immediately squelch the urge to press our noses into the display case and ponder instead which types and how many fried goodies did we have room for (and for later) today. Service was abit abrupt, as we think the kitchen staff was tired from lunch service (we arrived early afternoon), popped their heads out and promptly disappeared into the back and sent out a young teenager to serve us. He was friendly, but wasn't able to tell us much about the items other than what was already on the labels, but that was okay since we already knew what most of the items were... would make it tricky for newcomers though. They also didn't let us take pictures of our food in the restaurant without charging a sit down fee.. rather odd, but we took them home to snap pics instead. Sadly, we were too late and they were sold out of chicken samosas (my fav), so we picked up a decent selection of vegetarian, lamb and beef samosas instead. We also picked up some fried cauliflower, fried spinach mixture (not pictured since they weren't memorable). 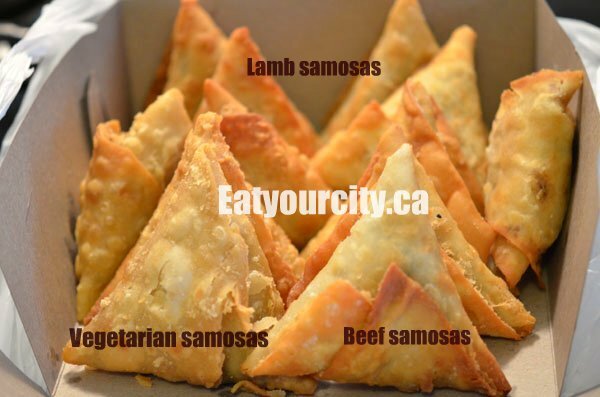 Though all samosas were seasoned with the same seasonings - cumin, coriander seeds (hard to tell), garlic and others I didn't bother identifying cuz I was in happy samosa land. The samosas were cold, so after a quick stint in the microwave, they were hot, stayed crisp and crunchy with a satisfyingly savory chunky-potatoey goodness inside. The lamb samosas were predictably a bit gamey because of the ground lamb meat used, with the beef samosas being a bit more savory than the vegetarian samosas as the beef ones had flecks of ground beef throughout the spicy savory little fried nugget. 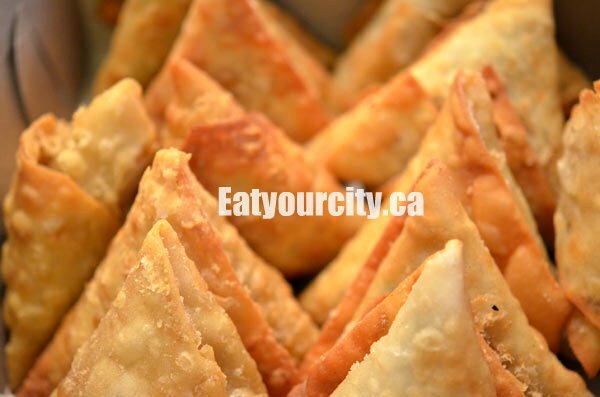 Though the customer service is a bit lacking, they do happen to make the best samosas in the city, so I can live with that as long as they continue to make the best samosas in the city. Don't forget to ask for the free dipping sauces - there's a spicy one and a sweet dipping sauce for you to dunk your samosas into. The samosas stand well on their own, but some enjoy them dunked into the dipping sauces. They also didn't let us take pictures of our food in the restaurant without charging a sit down fee.. I had numerous runs with restaurant staff and owners while taking pictures but this is a new one! OK, pictures don't seem to really convey what was sold so... What was the size of the samosa? And, how much $$$ each? 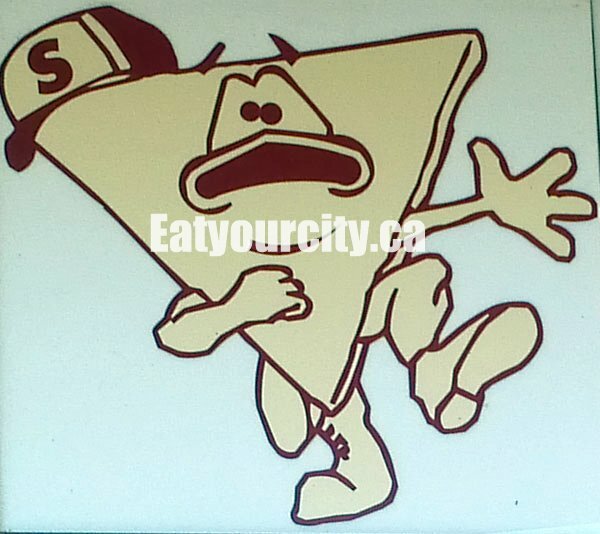 Samosas size: small fist (~2.5 inches measured from the furthest points). Ball park cost $2.25-2.75 each.. I don't remember cuz we bought other varieties of fried fare that day, and they were all within that range. That's takeout price, eat in price is a bit higher, but we weren't told how much higher. Heehee... the mascot is cute! I think its doing a heart attack dance, its expression is so frantic looking! 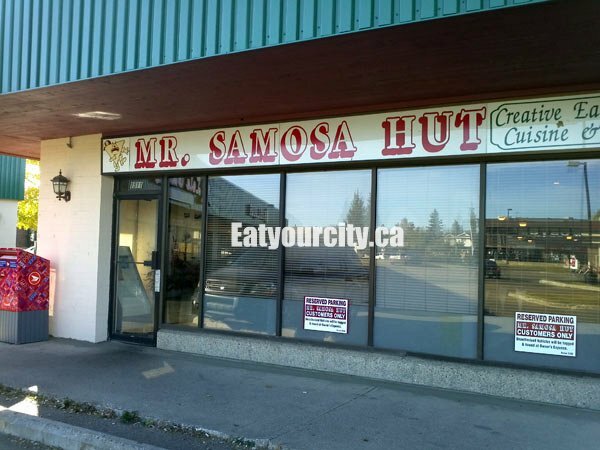 Changed their name, but they still offer really tasty samosas and sweets. Better sit-down atmosphere now, less "cheap".. Thanks!! I had heard a rumour they closed and I was so sad!